Seattle’s only $5 improv Halloween party. Your suggestions create the ghoulish laughter. 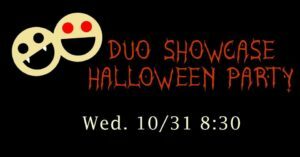 Start the night at 8:30 with a special Halloween performance of the Duo Comedy showcase. Two-person teams will be dressed in costume creating spontaneous hilarious scenes made up on the spot. Starting at 10:00 we launch this epic Halloween party with a costume contest, competitive games, and wicked dancing.